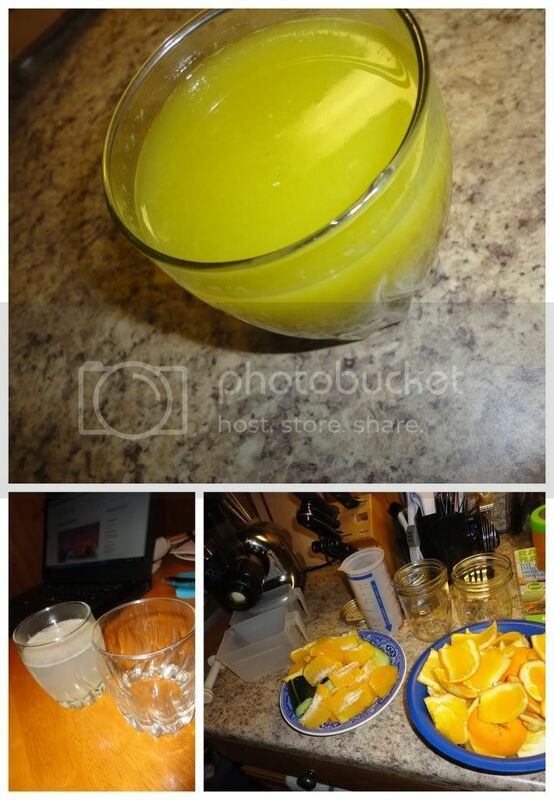 I stumbled across this post in search of ways to use up the ridiculous amount of oranges that are lying around our home. I'm not opposed to nutty-health quarks, so I was all in on trying out a detox and since Mike didn't argue, we went ahead and went for it. The post I read essentially recommended a single day detox which would begin in the morning with a glass of water mixed with the juice of one time to more-or-less prime the system. The rest of the day is enjoyed drinking water, herbal teas and 3 cups of fresh juice - your choice but she recommends sticking with the same throughout the entire day. In our house, on our first detox attempt our mix was: Cucumber, mango and orange - quite delicious and a beautiful green color to boot. In general, the day went better than anticipated, although I was ready for bed at 8:00 pm and definitely ready to get to eating the next day. However, I felt good, like my body was being given the chance to let go of some of the junk which I inevitably eat on a more-than-I'd-like-to-admit basis. Whether you opt to try out a detox or simply want a new juice recipe, we definitely enjoyed this combination of fruits and vegetables!